Here's the ride video of me leaving Robore, past the big red rock and through the jungle road, gives a nice idea of the countryside I rode through - very pretty and isolated with good quality empty roads. The weather forecast was spot on for once and it rained like crazy all day yesterday with high winds, the roads in the city were mostly flooded and a few trees even came down, but today I wake to blue skies and I'm looking forward to leaving the city and heading to Samaipata about 3 hrs West of here where I have booked a two night stay at an animal refuge - should be interesting. But there is no wifi there so I'll be off the grid for a few days. Other than that, all is good in central Bolivia! 95Monster, SmilinJoe, Junipertravels and 4 others like this. The AirBnB I booked in Santa Cruz was really nice, a huge mansion in a wealthy neighbourhood and just with Grandma and granddaughter there to look after me, which they did very well for just $10 a night! In the evening, when the rain subsided a little, I shot back out to the nearby farmer's market for some local dinner. In the morning I have a beautiful ride out through the mountains and along a large river which was running very high and dirty with all the rain. I also pass by a corrupt police checkpoint just before a road toll booth which I had read about on Ioverlander, the shifty looking cop who was there saw me coming and clearly signalled me to pull over into the carpark for document checking and for some reason I just thought, f$ck it, waved back at him and blazed right on by him and through the toll booth behind him :) Bikes don't have to pay road tolls here so the toll booth guy was uninterested. The ride was fantastic and I have some Gopro footage but it will take a few days to get uploaded, I'm using my phone's 4G at the mo to get this update done as the hotel where I am right now has no internet either. I stop in the village of Samaipata for some fuel (another successful negotiation from 9B to 5B/L) and some lunch before heading 5km out of town to the animal refuge where I had booked a room for a couple of nights. It has also been raining here for the last two days and when I get to a ford in the road the brown water is raging through what looks like a pretty deep river crossing, thankfully a car in front of passed through and so I could judge the depth and the fact that it had a concrete bottom and went for it, making it through no problems and with dry feet! The animal refuge is great, loads of animals wandering around wild and some in cages too and my room was also nice, big, clean and well appointed, so I'm very happy. The first animal I meet is the large Macaw who didn't get on with the other parrots so hung around with the people instead and liked a sip of mate. You get right up close and personal with all the animals here and it was great! Not to mention a whole bunch of cats and dogs that had also been adopted here. There was a large troop of these little monkeys who lived wild in the neighbourhood and just hung around for the free food, they were super funny to watch and pretty friendly as long as you were quiet and calm around them. This guy was probably my favourite, a wild Bolivian cat that looked a bit like a domestic cat but behaved like a tiger - he was beautiful! The toucans were very friendly and inquisitive and are just amazing looking birds. There were a bunch of these guys around, which they called badgers, and they were friendly too, one came to me every morning while I had coffee and hugged my leg wanting a scratch, very cool creatures but when I saw it yawn, the size of it's teeth scared me a little. In the morning these guys came around whilst I was having a coffee and one of them was checking out my cup when he suddenly decides to try and have a bath in my coffee cup! After 3 seconds or so he realises it is too hot, screams and throws a tantrum showering me and his buddies with coffee. On the second day I head out to check out the local ruins dating back to pre-Colombian times of around 500BC, known as Fort Fuerte Samaipata. It was later also used by the Inca people around 600 years ago and later by the Spanish. As I head back through the little town it was market day so I get some lunch and supplies for dinner - man I just love Bolivian markets! The ruins were a 20 minutes ride out of town through some great hilly twisties, Gopro video to come. The first settlers greatly revered the big cats and there were several large carvings of pumas and cougars. And these holes in the walls were used to store their own dead mummified family members so they could be prayed to and likewise revered. Back to the refuge and this guy became a friend too and loved a little scratch along his back, so cute and soft! I have a caught a mild head cold so I decide to stay another day and just chill and enjoy the animals. In the evening and early morning I could hear the spider monkey come and check to see if I had locked my door - cheeky bugger! Never caught me out though! And these guys were just always hanging around, here they are cruising along my deck on the way to breakfast, so funny to watch. So this morning I left the refuge and headed West and then South to the town of Villagrand where I am now, a lovely authentic little mountain village. In order to not have to go back through Santa Cruz and past the corrupt cops, I had decided to go this way down to the Argentinian border and stay on this (East) side of the Andes. Tomorrow should be interesting with about 300kms of gravel road through the mountains and along river valleys, apparently one of the most beautiful roads in all Bolivia (Route 22). There's not much along there so I might end up camping along the road somewhere, will go prepared and just see what happens. Oh, and it's cold now, am wearing trousers and long sleeves in the evening and all the vents on my riding gear are shut during the day, makes for a nice change! I am just loving Bolivia, one of my fav countries of this entire trip! yamalama, 95Monster, Meatn'taters and 15 others like this. Thank you for the update and keeping this ride report going! I've enjoyed the hell out of this report and the way you approach life, lessons for all of us! Love me some Toucan!! What a trip!! Awesome pics of the animals. Thanks for another great update. Here is the Gopro footage of the little ride from the animal refuge, across the ford (thankfully much calmer than the day before after a couple of dry days), to the little township of Samaipata. It's market day and so I stop in to get a nice brunch and some supplies for dinner. I also took some footage of the very nice and short 10minute ride back into Samaipata from the ruins, beautiful twisties, a pretty flooded ford and a big bunch of local bikers. Next day and the ride into Vallegrande was lovely, very scenic and quiet with good quality sealed roads, a super nice 3 hours. For the last week or so the bike has been running surprisingly sweet, before that I had noticed a slight but increasing stutter in power around the mid range and had though that maybe the plug or one of the carb jets was partly fouled, or maybe a few batches of bad fuel. I'd even picked up a new iridium plug in Santa Cruz and planned to swap it out if it got worse or I happened to have a nice and easy place to do it in, it's stupidly complicated on a KLR and requires removal of all panniers, side plastics, seat and fuel tank......... but I guess whatever the problem was has cleared itself and she is just feels better than ever, smooth powerful and it also feels awesome to be back on slower, scenic and twisty routes. It's always nice to fill up as you arrive at your destinations and be good to go in the morning and when I rock into the first gas station in town and am pleasantly surprised to be sold gas for the local price without any major arguments of issues ! Woohoo. And with a smile and friendly service to boot, just 3.7B/L, or 53 USD cents /L. I win the hotel game in a single play, with a nice clean/large well equipped suite, parking 1m from my door and only 50B a night, about $7 USD. I wander through the township, have a nice pipping hot lasagne for lunch in the market and spend a few hours just people watching in the square. I have a terrible night and am up very early waiting as the Pharmacy opens at 8 and 'pill up'. Given the strength and quick onset of this one I go for the proven Cypro 1500mg single dose, Imodium, anti nausea anti-histamine (metaclopramide, loratedine) as well as a few sports drinks and lots of water. They work well and by the afternoon I feel better and have a search online for local attractions and turns out that the communist revolutionary Che Guevara and his comrades were killed near here and their mass grave was found just down the road. Unsurprisingly, this is a highlight on what they have called "Ruta del Che". I meet a french couple back at the hotel on a Chinese 150cc bike and they are riding this route. I'm not really a fan of Che, his politics or the way he expressed them and so I am not keen to follow his route. But interesting none the less. Here's a few pics of the grave site and little museum there, between an old airstrip and the cemetery. Him and his comrades were killed right by this little town after a long running chase and many battles with the Bolivian army in '67. They chose to centre their movement here in Bolivia because of it's easy access through 4 borders and because it was next to Che's homeland of Argentina. The grave site was re-discovered in the late '90s and the remains were identified and returned to their various countries of origin. I am both looking forward and feeling apprehensive about the upcoming gravel ride through Ruta 22 down to Camiri. Garmin tells me about 200kms and 3 hours, google tells me the same but over 5 hours - that's a good clue to a difficult road and I will be very isolated and very alone. The weather forecast is closing in tomorrow but not really hitting this region until the day after so if I don't go tomorrow I will be here for a few days waiting for it to clear. Up early and the forecast still looks OK with only possible light showers in a couple of spots on my route. In Vallegrand the weather is beautiful whilst I pack up and I'm on the road by 8 AM for what could be a huge day and also one of my last big adventure-ride days for the trip! As I climb out of the valley the road immediately turns to gravel, bedrock, muddy and sandy bits.......this is going to be a long day, one of the most challenging days of my entire trip!! A glance back at Vallegrande as I head into the foothills of the Andes. Videos of that awesome ride are uploading now.......but will take a few days at this rate. And the other good news is that the bike sale is 100% in the bag and I have already been paid! Many thanks to Ozzy Haydon for making this a smooth process. I still have over 3 weeks to get to my flight out of Santiago a week before I leave so I have time to get everything sorted. At about 2500 kms over what will mainly be very good Argentinian roads, everything should work out about right. That is me for today, thanks for following along everyone and your kind support! All is good in South-central Bolivia. roadcapDen, SmilinJoe, 95Monster and 8 others like this. Sounds like it will be a couple of days before you will fart with any confidence a new pair of shreddies may be required. Normlas, dano619, powderzone and 1 other person like this. hey Dutchie, catching up on your posts again! Thanks 4 charing vids of the small towns showcasing Bolivian architecture, realy nice! I see the steed is still going strong! South America will miss the Duch-Kiwi but at least it seems that the black steed will roam the roads of SA. Here is a pic of the route I was hoping to get through that day, just a couple of hundred kilometres. The Google map time estimate is generally much better than Garmin's and so I am thinking maybe 5 hours with breaks..... Also happy to report that I am back in control of my bowels, thanks for the concern though. On the bike by 8AM and the skies are blue above me but don't look so nice in the direction I am heading, into the foothills of the Andes. I took lots of Gopro footage of this ride, it was spectacular and challenging. Here is part one. The road was very varied, from deep muddy trenches to bedrock or soft sand, with mostly packed and sticky clay on top without much gravel. Hard work and required good concentration. The views are spectacular, especially at the beginning, with huge drop-offs and dramatic mountain ranges. As I climb, the clouds start to envelop me and the rain sets in, making the sticky mud all the more slippery and the potholes more unpredictable. Not to mention fog and rain on both sides of my visor.....vis is near zero. The scenery continues to be awesome and the roads are pretty much empty, I see one truck and one ambulance in the first 2 or 3 hours. Nevertheless, I am only able to average around 20 or 30km/hr and rarely get out of second gear. Passing through jungle clad mountains ranges and coming through tiny little 2 or 3 house settlements there is lots of livestock on the road, mainly cows, pigs and chicken. At least the rain stopped, but the road condition remains hugely varied, kinda like the sh1tty driveway to a friends beach house, but this one goes on for 200 kms! It is still not clear how I am going to get across the Rio Grande, with a post of Ioverlander describing a 40 meter river crossing up to 75 cm deep! Garmin is telling me that there is a ferry and the locals tell me there is a bridge.....There are also a few flooded fords and streams to cross, aside from the deep water and soft-mud filled potholes, and pretty soon I'm riding in wet muddy feet. The road just gets worse and worse but I finally make it to the river to find absolutely nothing, no boats, ferries, houses or people, just nothing and the road is terrible with huge mud filled potholes and trenches - this can't be the main access to a river crossing ?? So back to deep potholes and I end up doing a bit of cross country along the rivers edge instead of the terrible road and in the end am very surprised to come across a huge and brand new three lane and beautifully built concrete bridge over the Rio Grande in the middle of nowhere and with terrible access roads. The road stay much the same after the big bridge and I almost lose it twice in deep sandy patches, aside from my back, my shoulders, arms and hands are really getting sore from all the abuse today. I finally reach the end of Ruta 22 in the little township of Ipita and am definitely ready to call it a day after almost 8 hours in the saddle, but they don't have any accommodation here. An old boy in the park tells me that the next town has a hotel on the square and is only 10 minutes down the (thankfully sealed) road. After a short siesta I head into the plaza where there are 5 little food stands spread out and one restaurant, a quick circuit and it turns out that they are all selling the exact same food, deep fried chicken, chips and rice..... hhmm, welcome to Bolivia, they absolutely love this meal and its what you mostly get offered on the road. The bike is filthy but she did stay upright all day which I think was an achievement! I sleep like the dead but am keen to get out of my average hotel and get to the bigger city of Carimi the next morning, it's only about an hour down the road. The plan is to spend a bit of time and find a nice enough hotel so that I can spend a few days there to chill and recover, and that is just what I do. On the second play I find a great hotel, one block from the square but super quiet, well appointed and clean with great parking for 90B a night or around $13USD - win! I settle in and head out for lunch, this is also a pretty typical "Almuerzo completo", or complete lunch, this one was great and included a huge bowl of beef, vege and pasta soup, a side plate of sprouted corn, the main was ginger chicken on homemade pasta and the drink was freshly squeezed maracuja juice - delicious, and all this was just 16B or about $2.30 US. Time for my old girl to get a good scrub so I head out in search of a motolavado with success. And back at the hotel nice and clean with an oiled chain, full gas tank and ready to hit the road again. Camiri is a really nice mid-sized town nestled in a valley and I am enjoying my stay here, I still have some time to kill and would rather spend that in Bolivia than Argentina or Chile. Here is a 'slight' piss-take I found for dinner, the burger was actually very good but the fries were greasy, floppy and cold (as often the case - they don't seem to mind this?). I end up having a very productive but also restful few days getting lots of stuff organised, settling on my route south and getting the bike nicely sorted. I'll probably head off tomorrow towards the Argentinian border at Yacuiba, about 3 or 4 hours directly South of me. XR Valdeez, Meatn'taters, 2hardgiveup and 9 others like this. pepelopez, Normlas and MrKiwi like this. 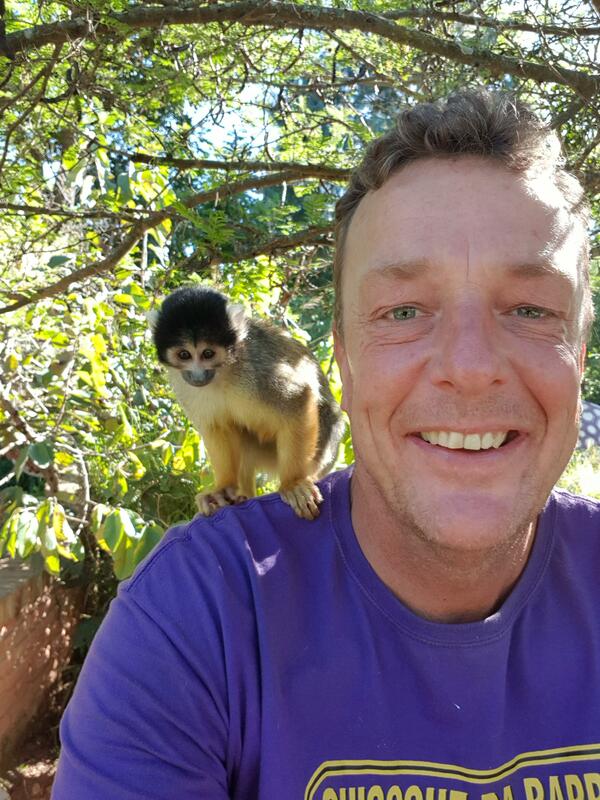 Really enjoying your RR, been trying to get the wife to make a similar trip, and your pictures have convinced her, we are leaving in June heading south from colombia, the whole reason for moving here..keep it up and stay safe. Normlas, ScotsFire and HiJincs like this. Thank you, I appreciate you letting me know, makes me feel great to think that I have inspired someone to take a similar adventure, you won't regret it! Thanks mate, always good to hear from you, I have been doing some pretty big days lately and am already almost in Mendoza!! The weather in Camiri continued to be pretty average with light rain throughout the day so I decide to stay put for another couple of days and wait it out. Here's another typical steak dinner for only about $5, unfortunately, as opposed to their neighbouring Argentina and Brasil, the Bolivians are not very good with steak and it's almost always overcooked and dried out. One of the issues is lack of cooling space means that they don't age the meat at all, they typically walk the cow to the market, butcher it on site and sell the entire beast on the same day. This religious parade passed by while I was enjoying my "flash up" dinner. The weather finally breaks and I head out of Camari aiming my steed South towards the Argentinian border at Yacuiba, unfortunately the weather turns wet once again and I ride most of the 4 or so hours in light rain and wearing the crotch funnel.... It is a very nice ride though, through jungle covered mountains and small villages. At a gas stop I get given petrol at the local price without questions ! Score, 3.7B /L is nice and cheap - about 50c/L. Yacuiba is a pretty large border town and I win the hotel game on the second play finding a pretty OK place right by the plaza with great and covered parking as it rains the entire night. I head out and get a few Argentinian pesos for the next day and have an early night. Seems the military police here are using KLR's !! Queue #3, Argentinian immigration for my entry stamp - only 10 minutes and then finally the Argentinian aduana for my new bike permit, again only 10 minutes but there is problem..... Apparently when I last crossed into Argentina near Ushuaia they made a mistake and never cancelled my TIP and he shows me his computer screen with a big red banner flashing - sh1t !! Apparently this can't be fixed easily and he goes to get his supervisor to help, about 20 minutes of discussions and they ask if I have any copies of the documentation of my previous TIP for when I left Argentina for Brasil, thankfully I take photos of all these docs on my cellphone just in case (this is very useful practise and I highly recommend everyone do this!!) and so I did have copies - and they were happy with that and issue my permit, thank goodness, it was a nervous moment for sure but having photos of these documents saved my arse! And just like that I am back in the land of the YPF service stations and their excellent coffee and media lunas, yum !! I end up doing a pretty huge ride day at over 350kms and 6 hours in the saddle and make it all the way to just South of Jujuy, I end up making a mistake on my GPS, missing my goal town and then just rock up to a roadside hotel near General Guemes. 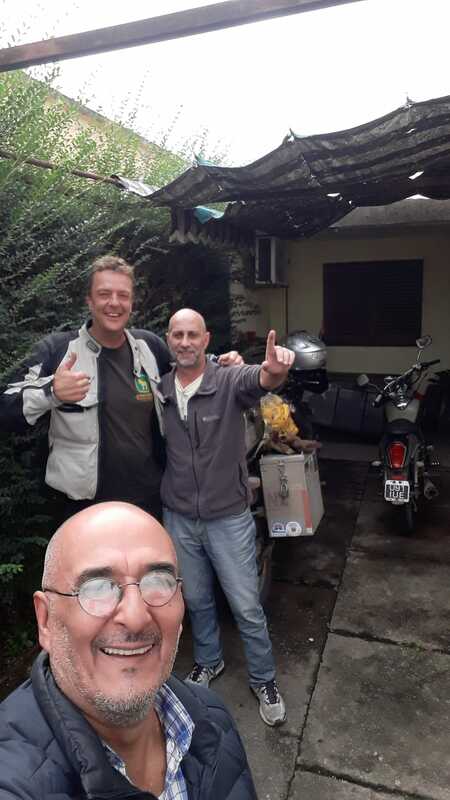 I was keen to catch up with the guys from the Salta motoposada Ruben and Federico but unfortunately they are away for the Easter holidays. 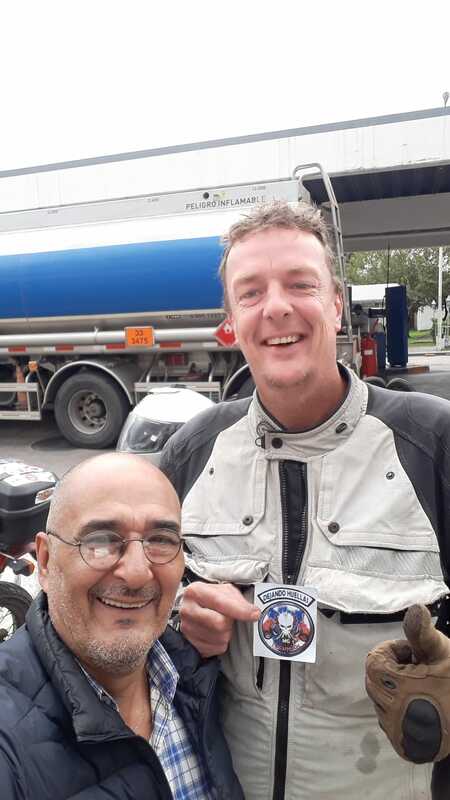 The next day and I aim for the city of Tucuman and get hooked up with another motoposada there through the MAI Argentina WhatsApp group. Daniel agrees to meet me at a YPF gas station just on the edge of town and lead me to his mates place where I am welcome to stay for as long as I need. And sure enough there he is waiting for me as I pull into the gas station, meet Daniel. And we head to his mates place in an outlying suburb, meet Mauricio. It's only about 5pm as we settle back in to his place and have a couple of cold ones, Mauricio is more of a beer guy and not really used to drinking spirits, I mix mine with coke but he has his straight and starts knocking neat whiskey back like you might a beer...... this is not going to be a long night for him at this pace! We have a nice couple of hours chatting, drinking and listening to music, he has a cat which belongs to a family friend and he doesn't like the cat, the cat clearly is not big on Mauricio as well but quickly pics me as a cat person and happily settles in on my lap, much to Mauricio's surprise. Unfortunately he is one of these guys who gets aggressive when he has had a few drinks and the atmosphere turns uncomfortable, there's not much I can do as I consider bailing on him but where would I go? and I've had too many drinks to even think about riding anywhere.... bummer.... Man I just hate people like this but I am kinda stuck! Luckily it doesn't get too serious and doesn't progress beyond annoying and uncomfortable, although he had promised to order dinner for us, he is in no state to use his phone and this upsets him even more.....he keeps drinking at an insane pace and thankfully is KO'd pretty early on in the night . 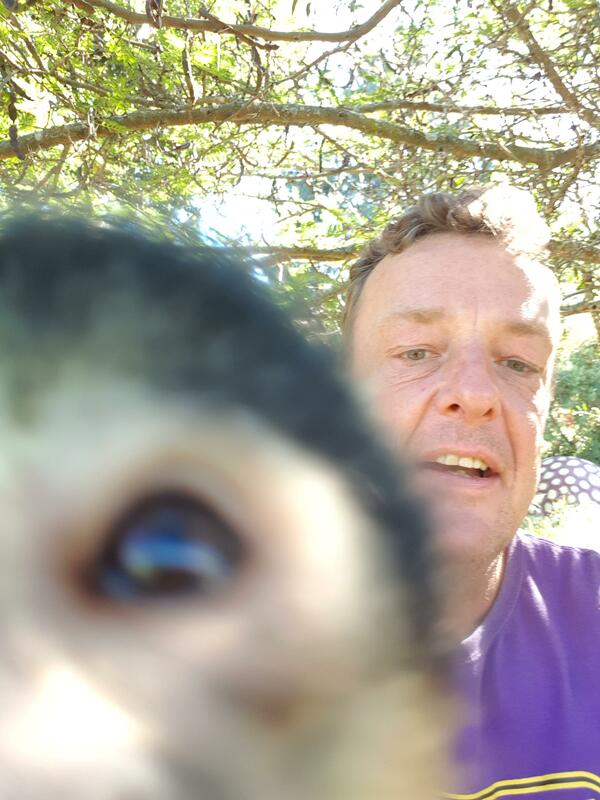 I had said that I was going to stay for two nights and check out Tucuman's centre the next day but I am not keen to stay and pack up early to head further South. Also, given it's Easter the entire city is shut down and nothing is open other than the churches. In the morning Mauricio is surprised that I am not keen to stay, I don't think he remembers all of what went down the night before. Although he does apologise for his behaviour, I am not very interested and am on the road by 9am. The ride is beautiful as I cross through scrubby deserts with huge cacti and have the Andes on my right hand side for the whole day. I have a really nice day riding and enjoy perfect weather, dry and sunny and a very comfortable 20 degrees or so. When I get to my goal city of Catamarca I play the hotel game but it's very hard going as most places near the centre are full for the Easter holidays. I finally get a place but it's very old and dirty and the room is right by the bus terminal and noisy most of the night. The city centre is very nice but most places are closed and there aren't many people out and about. The cathedral is open and pretty nice, there is also a Santa Maria museum attached and so I get a little culture too. The weather forecast is pretty bad for the next 3 or 4 days with rain predicted throughout the day and nights, I consider staying in Catamarca but the hotel is just too nasty so I decide to take the gamble and head South towards the city if La Rioja, only about 2 hours away. It's a city where I stayed when I was heading up Argentina a few month back. At a coffee stop about half way there I get a very sad email telling me that my favourite Auntie has passed away in Holland, she had been suffering from cancer for some time so it was not a surprise but it did really affect me and I spend most of the day in a dream-like state reminiscing. I get to La Rioja pretty quickly but am just not in the mood to settle down and have a chill afternoon, I feel like riding and hope that it helps to clear my head so I continue South for a few more hours. I pass through a few small towns and try to get a hotel but they are all full - this is looking like it's going to be a problem day...... But the ride is fantastic, beautiful desert with the mountains beside me and good fast roads, this is a really nice part of Argentina. At this point I am just focused on getting me and bike back to Santiago safely and in good condition so I can hand her over to her new owner in good shape. The bike is still running great but my head is just going overtime the whole day, thinking about my dear Auntie as well as this adventure coming to an end and me having to return back to normal life, it's been a tough few days! Depending on the weather I aim to get to the city of San Juan tomorrow and then on to Mendoza before crossing the Andes back in to Chile. My goal is now only about 700kms away! So a pretty busy and difficult few days behind me and over 1500 kms knocked off, but I am doing OK and a little adversity just makes you appreciate the good days all the more and there have been so many more of those! Greeting to all from West-central Argentina and thanks everyone for following along and for your feedback - always appreciated. Tijuana_Taxi, SmilinJoe, powderzone and 6 others like this. Nice update! Last post was great, you got some bittersweet moments coming up for sure!! Look forward to next update, been following along from day one! !